I'm excited! 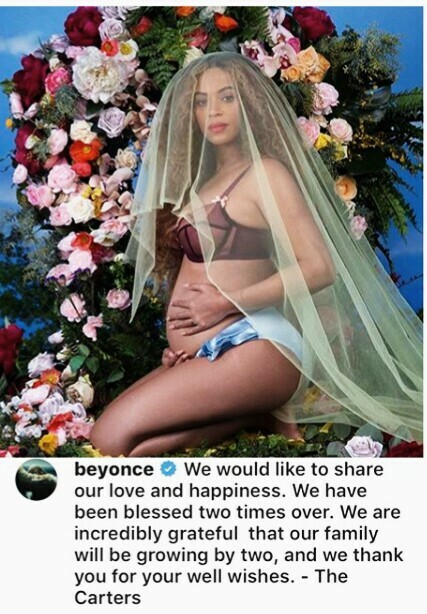 Beyonce is pregnant with twins! ~ CK Jacob: Nigerian Fiction And Lifestyle Blog. The singer announced the great news on her Instagram page. She is glowing! You need to have seen me screaming for joy around my house. You woud have thought i won an award. Lol My siblings were surprised with the way I was jubilating. Yes I am very happy! I am a huge fan, dont bame me. Beyonce is queen. She killed two birds at the same time! Jay Z is a sharp shooter. Beyoce broke the internet! Twitter was on fire. Her mom and Rihanna also shared the news and congratulated her. Blue Ivy will be having younger siblings soon. I am very happy for her! Yippee!!!! Yeah, its actually a great news... To even think i was just thinking about them having another kid and this came up immediately is amazing.